A relatively unknown White House aide has seen the importance of his job grow under new chief of staff John Kelly. 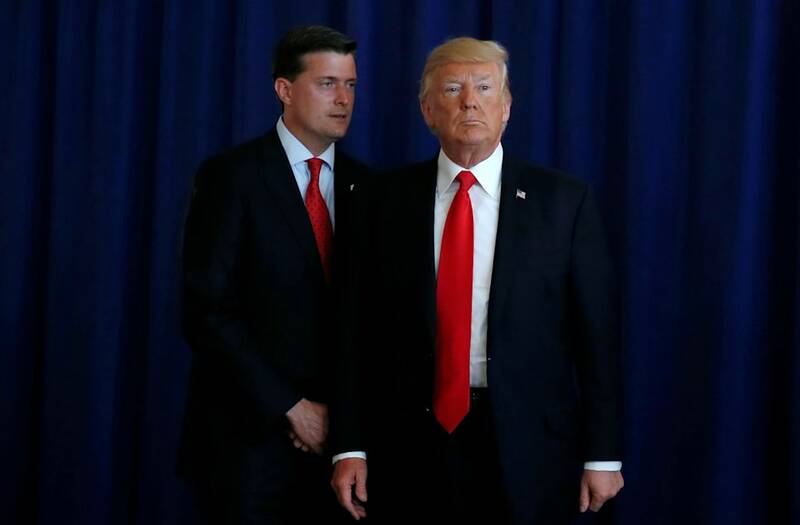 Rob Porter, the White House staff secretary is tasked with vetting all the information that makes it to President Donald Trump's desk. His role is important for Trump, who has been known to share dubious and false information. The photo went viral six weeks ago. Many of the most bombastic players of the Trump campaign and administration — past and present — are there. There's Corey Lewandowski, Trump's first campaign manager. There's Omarosa Manigault, the "Apprentice" contestant turned communications director for the office of public liaison. There's Anthony Scaramucci, he of the week-long stint as White House communications director, wearing his trademark sunglasses. There's Sebastian Gorka, the counterterrorism adviser and cable-television blusterer, who was ousted two weeks ago. Then there's Rob Porter. He's in the background, observing and taking it all in. He's the most important person in the photo. One former top Senate aide compared the photo to something out of the Quentin Tarantino movie "Reservoir Dogs." The aide said the photo perfectly illustrates "just sort of how I view" Porter in the White House. "He's there but he's not quite being of the circus aspect of it," the aide said. "Which is what you want." In all likelihood, Rob Porter isn't a name that comes to mind when you think of President Donald Trump's White House. Based on what he's tasked with, it should be. Porter is the White House staff secretary and assistant to the president for policy coordination. He has been at the helm since the Trump administration's first day. He's tasked with vetting and filtering what reaches Trump's desk. And under new chief of staff John Kelly, his role has been further reinforced. Last month, Politico and The New York Times reported on a pair of memos Porter and Kelly signed that codified the procedures for presenting Trump with any sort of information. As it goes now, Porter must vet and clear all news articles, legal documents, internal and external policy memos, and agency reports before they make it to Kelly's desk. Once Kelly then signs off, the information lands on Trump's desk. In the latter of the two memos, Porter and Kelly devised a system to ensure that all sides of a policy issue for those which have a legal aspect are run past them prior to making it to the president. So Porter, a little-known White House aide who has avoided getting caught up in any of the West Wing drama that has plagued the administration for the better part of seven months, serves to review everything before it makes it to the president's desk. Given how the president has both shared dubious information at times when aides have presented him with reports from less-than-credible sources, Porter's role has an outsized importance. Porter, a Rhodes scholar who attended Harvard with White House senior adviser Jared Kushner, was close with former chief of staff Reince Priebus from shared time at the Republican National Committee. He served in the offices of Republican Sens. Mike Lee, Rob Portman, and Orrin Hatch. Porter finds himself as someone who can connect to the various factions and ideologies competing in the West Wing. He's managed to keep a low profile, stay above the fray, and avoid stepping into many of the squabbles in the administration's early months. The White House did not return a request for comment. But as a roughly half-dozen former Senate colleagues told Business Insider, many on Capitol Hill are thrilled that Porter is working within the administration. Talk to people who worked with him in the past, and they'll repeatedly mention his intelligence, experience, and team-first attitude. "It's not surprising to anybody who knows Rob that he's avoided the squabbles and turf battles that have consumed so many others in this White House," Brian McGuire, a former chief of staff to Senate Majority Leader Mitch McConnell, told Business Insider. "He's a master of discretion whose instincts and experience suit him perfectly for the task of ensuring that personality clashes and process fouls never interfere with the president's right to get only the best information and advice from his team." McGuire said Porter is someone who is both "an honest broker who respects diverse viewpoints" and "also knows when to close the window and drive a decision." Saying that Trump is "lucky to have someone of his caliber in that role," McGuire pointed to Porter's judgment as crucial for the role of vetting what makes it to Trump's desk. That, he said, will help "not only in terms of identifying helpful and unhelpful information, but also presenting it to the president in a way that will serve the president's interests above all else." "I think you want somebody in that job who has the president's interests at heart," McGuire said. "And again, the fact that Rob has not found himself at the center of any of these various turf battles has shown that he is not in this for himself so much as he's in it for the president." One former top Senate aide was not surprised that Kelly, who the aide said brings a "high level of discipline and detachment but also commitment to the task at hand" in the White House, would identify Porter as an "important ally" in getting the ship sailing in the right direction. Josh Holmes, also a former chief of staff to McConnell, said Porter's presence in the White House gives him "comfort," knowing his "caliber and credentials." "I think what makes him particularly valuable is he'll concern himself with the substance of the job and the execution of the task that he's given," he said. "There's an awful lot of folks who just want to show up in the background of a camera shot, and that's just not Rob. He's not in it for the glory or the perceived power, he's focused on trying to get the job done right." Porter's staying out of the spotlight while top West Wing officials were caught up in rampant infighting that often spilled out publicly is a "testament to his character," Holmes said. "Whatever you want to say about the Trump administration, for the first seven months, the West Wing was a soap opera," he said. "But one character you never heard from was Rob. And that's because he was focused on doing his job." "He didn't get caught up in who's up and who's down," Holmes said. "He didn't get caught up in whose fault things were when something went wrong or who takes the credit when something went right. He just kept the trains moving. And in all honesty, if you could fill an entire West Wing or Senate office or whatever with folks like that, you'd be in a very, very good place for execution." As Politico reported, Porter "has assumed a pivotal behind-the-scenes role" in the White House. He worked even before Kelly's arrival to help serve as a mediator between competing factions in the building. Politico reported that he has mediated trade disputes between free-trade-favoring Gary Cohn, the director of the National Economic Council, and the more protectionist Peter Navarro, the head of the National Trade Council. Still, there are obvious limits to Porter's role as a sort of vetter-in-chief. The president still accesses his Twitter daily, where a select group of 45 accounts have the ability to present him with any piece of unvetted information they decide to promote onto his feed. In addition, the president has even lately found himself in hot water for his retweets — like when he promoted a meme of an image of himself "eclipsing" an image of President Barack Obama. The person whose account he promoted the meme from had just days earlier posted anti-Semitic comments. Trump later promoted comments from fringe far-right author Dinesh D'Souza. He also highlighted a comment from conservative pundit Katie Pavlich that had incorrectly said Obama pardoned Chelsea Manning, the US Army soldier who had provided documents to WikiLeaks, to help defend his controversial pardon of former Arizona sheriff Joe Arpaio. Obama had commuted her sentence. And as both The Washington Post and The New York Times reported last week, Trump has bristled at Kelly's tightening grip on the White House. The Times wrote that Trump has "bridled at what he perceives as being told what to do." "It is inevitable that a guy who will not be contained and does not want to be handled or managed was going to rebel against the latest manager who wanted to control him," Roger Stone, a longtime Trump confidant, told The Times. "Ultimately Donald Trump is his own man, and he’s going to resist all the control and regimented systems Kelly is trying to impose." Stone told Business Insider he did not know Porter, but is interested in finding out more about him. The president still relies on Fox News as his primary source of information, Trump aides told The Times. With Kelly and Porter now approving all the news printouts that make it to the president's desk, some of Trump's favorite outlets are now — at least for the most part — nowhere to be seen. That led Trump to ask a friend where the stories from Breitbart and The Daily Caller were in his news package, The Times reported. But even with the president reportedly peeved at some of the new controls, there remains little doubt that once Kelly's tenure as chief of staff began, order has — for the most part — begun to fall into place. And Porter's service has helped usher in that stability. Mark Isakowitz, Portman's chief of staff who worked closely with Porter when both were at the senator's office, said Porter's message from when he first decided to work for Trump has been "'I want to serve the president, I want to serve the country, I know what the job requires.'" "What sort of struck me is this wasn't someone who was driving a factional agenda or was there to represent some subgroup of the party," Isakowitz told Business Insider. "He was there to serve the president of the United States and do an excellent professional job. And he had the discipline to not take his eye off that ball. That's how he conducts himself, that's how people see him. He's trusted. ... You need someone of a very high level of competence in that job." And Porter is someone who "really gave everything to work," as a current top staffer for a Republican senator told Business Insider. "I'd leave the office at 8:30 or 9 at night and he'd still be in there working," the aide said. "He would always joke around with people who would leave at 7 or 7:30 p.m., which was already late for a lot of people, 'getting out early tonight ah?' You know, he was good natured about it. It was never like, stay in the office just to stay in the office." The staffer described Porter's "dedication and work ethic" as "unmatched by anyone I've ever met." With Porter now finding himself in a central White House position executing what in the Trump era is a more-than-usual critical job, the staffer said Porter deserves credit for helping the West Wing start to mellow out. "It's good for people to see what he's doing," the staffer said. "He's kept a low profile, which I think is smart. But I think as people see order come into the White House, they should have the opportunity to see part of the reason why."